Rifting action in North America most recently began in Baja California, creating a new ocean, the Gulf of California. This action has proceeded very quickly in geologic time, taking substantially less than 10 Ma. Continental rifting normally takes many tens of millions of years. The question is why? And when rifting is involved, there is normally significant volcanic activity. This region is no different. 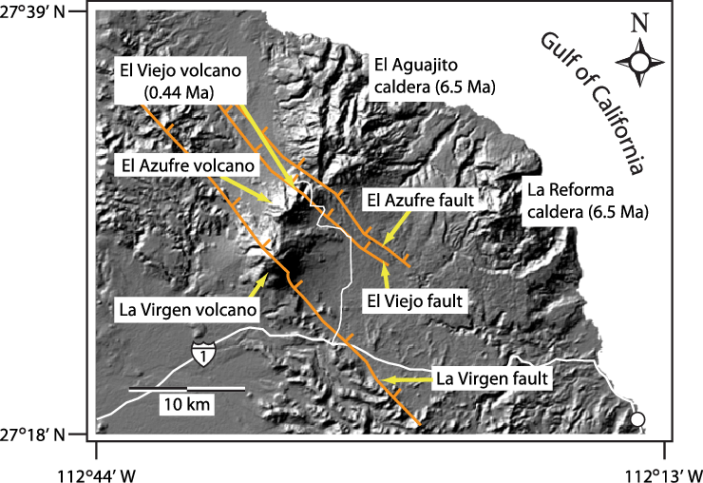 Not only did it have significant volcanic activity before the rifting event, but the high speed of rifting appears to be related to the older hot, volcanic region that weakened the North American crust in western Mexico, allowing the rifting to proceed quickly. The rifting process led to recent volcanism on both the newly formed sea floor, and on the separated portion of the Baja California peninsula. The region continues to be seismically active. Finally, we have formation of new sea floor in the Gulf. 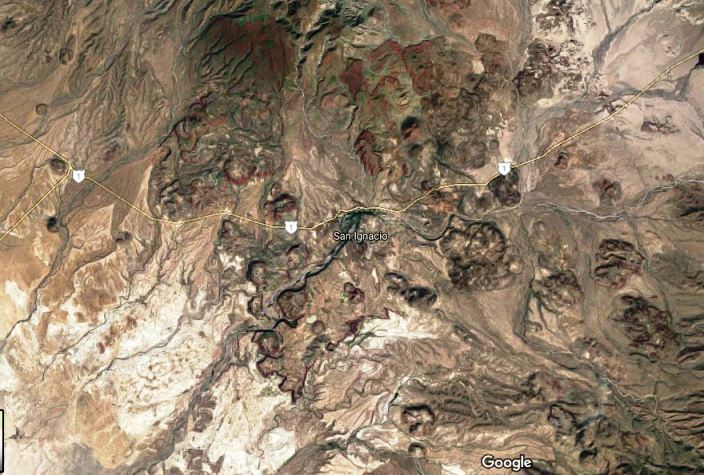 This one also has a twist, as its northern reaches are covered with over six kilometers of debris eroded by the Colorado River. Sea floor formation is proceeding northward underneath that blanket of debris. The Baja California peninsula separates the Pacific Ocean from the Gulf of Colorado. It is 775 km long, 40 – 320 km wide, mostly desert, mountainous and is divided into two Mexican states. The backbone of the peninsula are uplifted mountain ranges formed by Jurassic and Cretaceous batholiths, part of the same chain that formed the Sierra Nevada in California. That batholith was created by the subduction of the Farallon Plate under North America. The economy in both Baja states is driven by manufacturing, tourism, agriculture, and fishing. The largest city is Mexicali with perhaps 75% of the total population of the northern state. The southern state has perhaps a fifth of the population of the northern state. 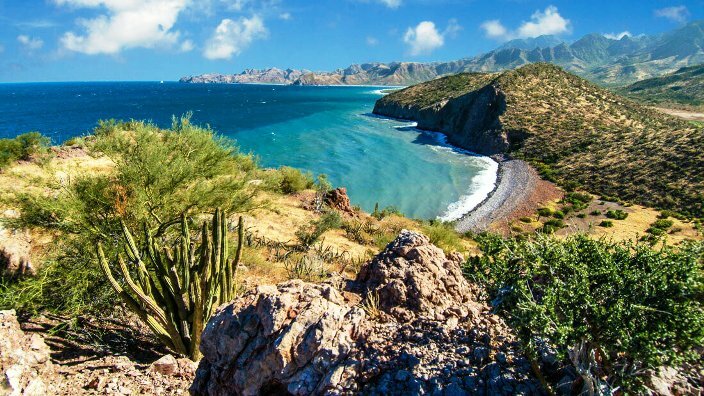 Baja California Sur (southern state) has the longest coastline in Mexico and the most islands. As we saw with the tectonic introduction to the Walker Lane, the evolution of Baja California and the Gulf of California was initially driven by the subduction of the Farallon Plate under North America. That subduction went on for nearly 100 Ma starting in the Jurassic. It uplifted mountains and supplied significant magma for a chain of volcanoes and unerupted batholiths. That subduction mostly stopped with the arrival of the East Pacific Spreading Center / East Pacific Rise which divides the Pacific Plate and the Farallon Plate in North America, some 45 Ma. That rise is still visible and active today, stretching south and connecting with the Pacific Antarctic Ridge. After the arrival of the East Pacific Rise and end of Farallon Plate subduction, an extensional regime at the boundary of North America started 35 Ma. Extension eventually peeled off the western portion of North America, opening a narrow trough that eventually got deep enough to fill with sea water. This extensional regime extended into much of western North American, creating the Basin and Range Province. It effected the entire southern portion of the Basin and Range Province from southern Arizona to the Trans-Mexican Volcanic Belt, with two branches around either end of the Sierra Madre. 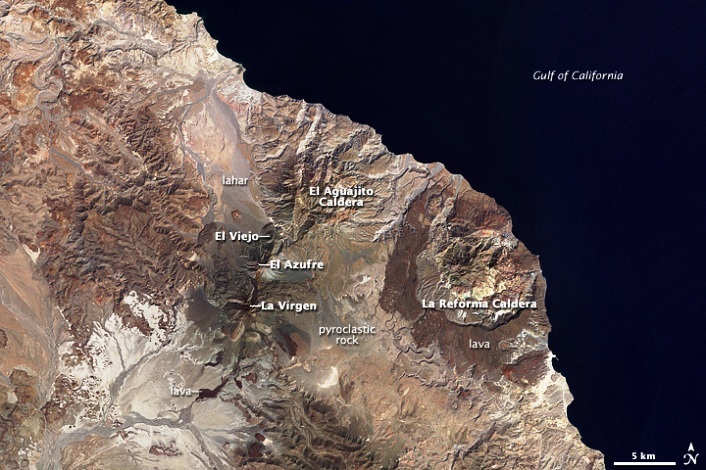 One researcher believes the batholiths of the Sierra Madre constrained the extension event to the Gulf of California. The Sierra Madre is viewed as an unextended batholith island surrounded by extended terrain. Attachment of western moving segments of North America (Baja California) to the Pacific Plate started 12 Ma and was complete perhaps 7 Ma. The new relative plate motion by the Pacific Plate was NNW relative to the North American Plate. 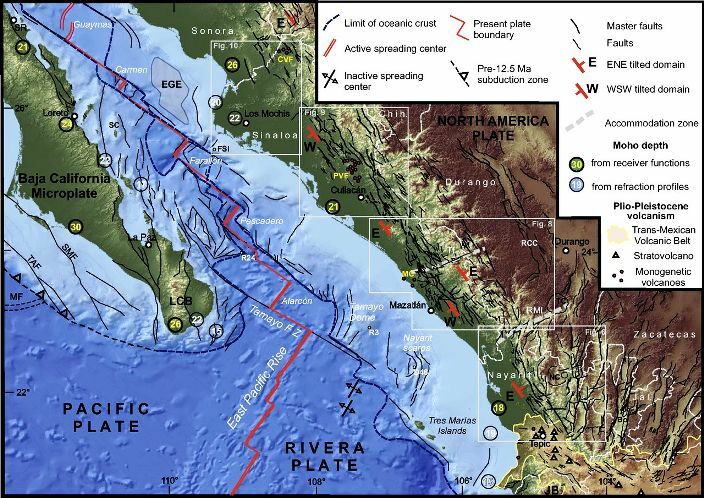 The plate boundary is mostly strike-slip transform faults connected with small short spreading segments forming new oceanic seafloor beneath the Gulf of California. There was a long period of stretching and thinning of continental crust the preceded formation of the Gulf of California 13 – 7 Ma. The entire area is the Gulf Extensional Province. Extension was episodic, with mantle heat from the thinning continental crust weakening it and allowing the formation of the rift along a long, narrow belt of hot, weak crust from the volcanic arc active immediately before formation of the new boundary. With the rift separating Baja California from the North American Plate, the separation progressed with episodic creation of basins and the filling of those basins with sea water as the basins worked their way north into California. This is where the Colorado River got involved, filling those basins with river-derived sediments, essentially the volume of sediments eroded by the Colorado River from the Colorado Plateau while it cut Grand Canyon over the last 6 – 5 Ma. Today the Colorado River Delta is just south of the California Border. It currently resides in the Salton Trough, on top of perhaps 6 km of debris above newly forming seafloor. This debris was successively deposited as the basin subsided. 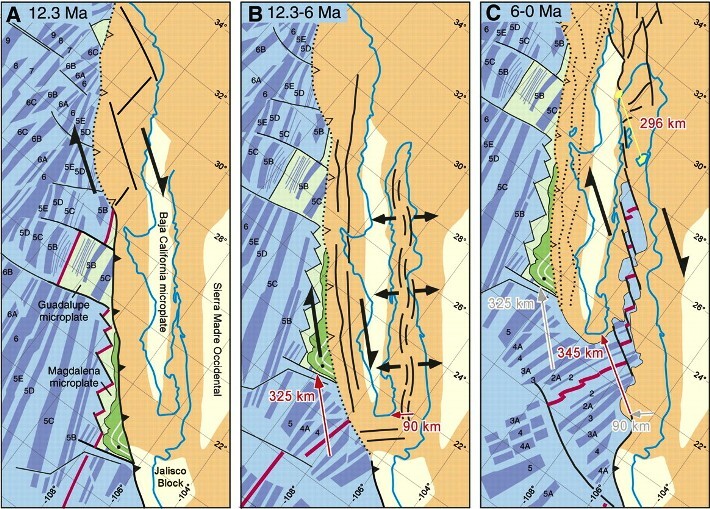 The relatively short time to rupture continental crust and formation of new oceanic crust in the Gulf is thought to be driven by the thinned and weakened crust due to Basin and Range extension; the rapid plate motion moving the Baja away from mainland Mexico; and finally the oblique movement along the new plate boundary, which led to the formation of a series of pull-apart basins. In contrast, normal rifting of continents and creation of new oceans is a 30 – 80 Ma long process that often involves flood basalts and Large Igneous Provinces. The San Andreas – Gulf of California fault system is the geologically complex boundary between the Pacific and North American Plates. Over the last 1.5 Ma, it has changed speed three times, currently moving at 40 – 48 mm / year. The Baja California peninsula has been undergoing uplift over the last few hundreds of thousands of years. Uplift rates vary along the peninsula, higher in the south and lower in the north. Some portions have uplifted at least 330 m. Others in the 25 m range. 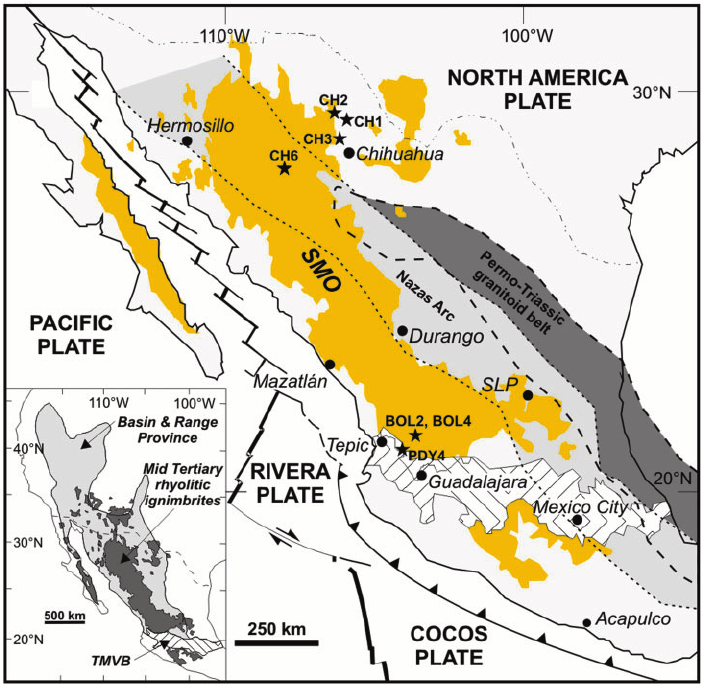 The subduction of the Farallon Plate beneath North America generated significant volcanic activity in the Sierra Madre in Mexico. There was an uninterrupted subduction trench offshore the west coast of North America from Canada to Mexico. The subduction drove volcanic and mountain building activity similar to what we see in the Andes today. Subduction also delivered islands and chunks of terranes to the west coast of North America which accreted to grow the continent to the west. The system of mountain ranges stretch from Alaska to South America. There were two episodes of volcanic activity 100 – 45 Ma and 34 – 23 Ma. There was activity in what is now the eastern Baja California and westernmost Sonora 24 – 10 or 8 Ma. The final phase of this subduction formed a continental volcanic arc 24 – 15 Ma. 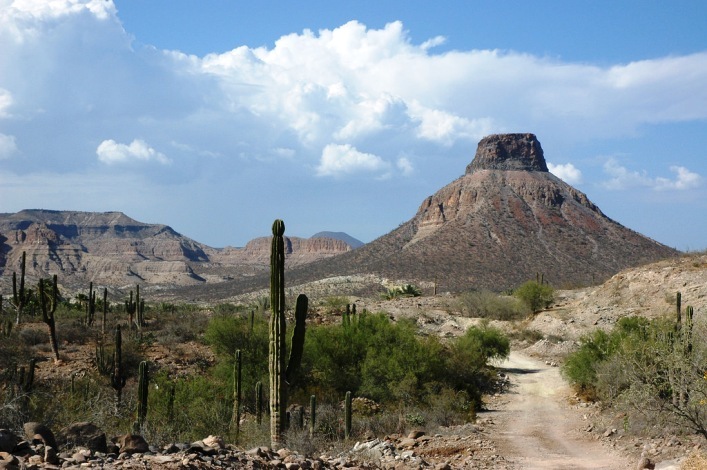 These are uplifted mountains in eastern Baja California peninsula and the Sonora desert. The Sierra Madre is a rhyolitic caldera province. The eroded core of this volcanic range is represented by the batholiths of the modern Sierra Nevada. The style of volcanism changed significantly after subduction ended. 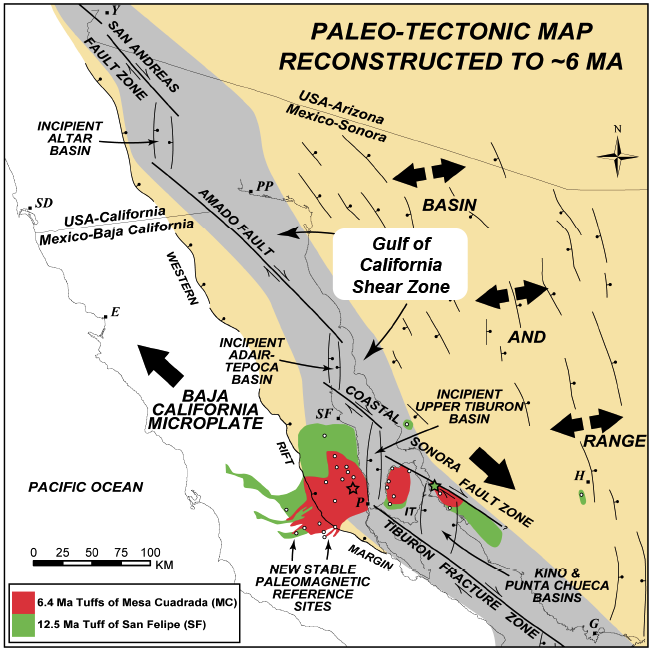 At 10 Ma, the Esperanza basalts were erupted in a series of sheet flows in central Baja from the newly forming rift. Total volume of these flows is in the 25 – 40 km3 range. 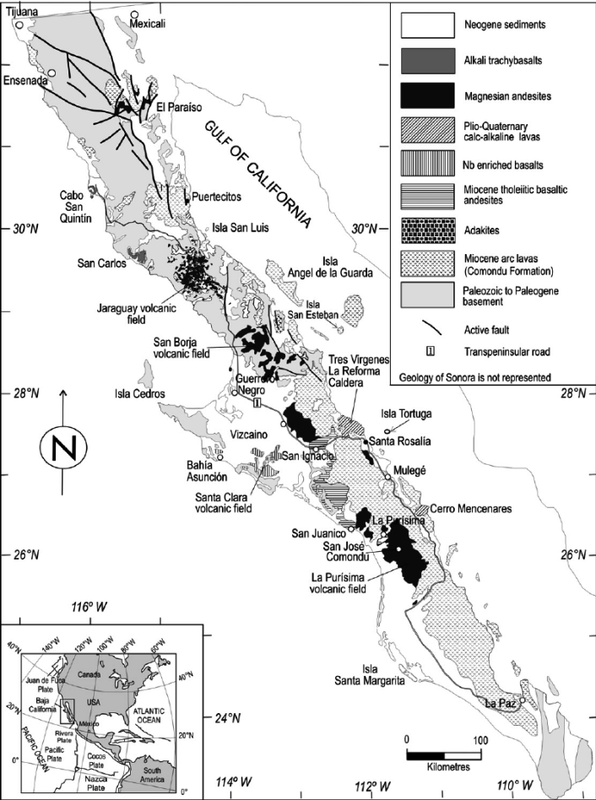 Later volcanic activity was largely confined to four volcanic centers – San Quintin, Jaraguay, San Boja and La Purisima, which also includes the Tres Virgenes / San Ignacio area. These centers erupted diverse products. Calc – alkaline volcanism continues in the Tres Virgenes stratovolcanoes. Predominant magmas elsewhere are basaltic andesites and andesites. 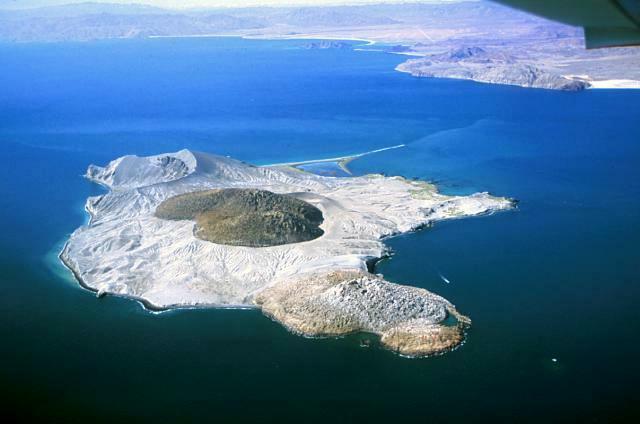 The San Quintin volcanic field north of the Jaraguay and San Borja volcanic fields, erupts alkali basalts. We will describe the fields generally from north to south. Any time you have spreading ridges and new seafloor creation, you have hydrothermal vents, springs, and similar features. These have been discovered in the Gulf of California and are present throughout the length of the newly formed Gulf. Coastal springs discharge heated water (mix of seawater and heated ground water) to 90 C. The Buena Vista Fishing Resort between La Paz and Cape San Lucas uses water from a hydrothermal spring that runs under the hotel. There was a possible submarine eruption reported July 1953 off the west coast of Baja California. Fishing boats reported dead fish and mud bubbling up at sea 2 km from San Cristobal Island. There was a second report by a Scripps vessel near the island of Cedros, not far from San Cristobal Bay. 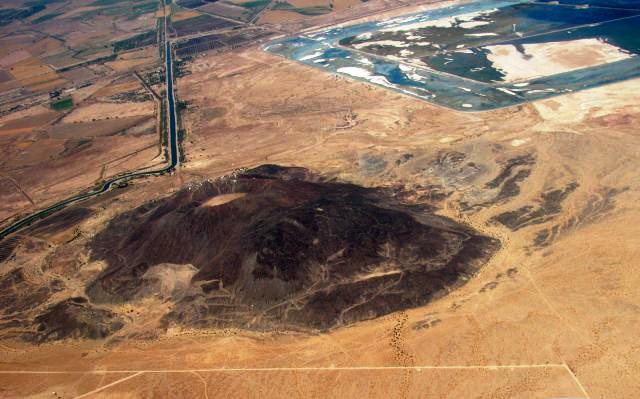 A second seafloor volcano was discovered along the Alarcon Rise in 2012. It is a small silica dome constructed from rhyolite with dacite lavas. The dome is pretty deep, at nearly 2,400 m located in the Gulf of California. There are explosive eruption deposits along the ridge. The rifting process also broke numerous islands off the peninsula and mainland, so not all Gulf islands are volcanic. Some of them are actually parts of the mainland separated by the ocean following the rise of sea levels following the end of the last ice age. This complex is located at the head of Gulf of California, 33 km south of Mexicali. There is a small dacitic lava dome complex in the Cierro Prieto geothermal field. Dates 10,000 – 100,000 years ago. Local native legends describe a monster that covered the land with hot rocks, grew through the soil and emitted fire tongues. The eruption that created it started with dacitic lavas that explosively interacted with saturated sandstones. This produced brecciated lavas. Next was an effusive phase that created a lava dome soon destroyed by a phreatic eruption. Effusive activity created another three domes and a fissure lava flow. Erosion after the eruptions stopped placed a debris field around the dome complex. Eruptive products throughout were primarily dacite. The complex is located near sea level on the Colorado River delta. The largest dome is 223 m high topped with a 200 m crater and is located in an active continental rift. The area provides sufficient heat to support a geothermal field and electrical generation operation. El Pinacante began as a single large now dormant shield volcano, Santa Clara. It is 1,200 m high and surrounded by over 500 cinder cones, maars and lava flows. Its lavas range from 1.7 – 1.1 Ma, though the entire volcano may be as old as 4 – 3 Ma. It is overlain and flanked by younger cinder cones, lava flows, maars. Cerro Colorado is a 1.1 km diameter tuff ring. The youngest dated large crater is MacDougal Crater at 185,000 years old. The oldest is Elegante Crater at 460,000 years old. The youngest lava flows took place 8,000 – 16,000 years old. Two are dated at 12,000 and 13,000 years old. The oldest dated lava flow is dated 38,000 years old. The largest lava flow covers over 30 km2. It is called the Ives Flow and has a maze of lava tubes. The Ives flow is pahoehoe and alkali basalt. Its source was a 3.5 km long set of fissures near the base of Santa Clara. There are spatter ramparts. Lava flowed south and east, as far as 13 km from the source. There is a small area of aa. There is a large flowout where one of the lava tubes drained and its roof collapsed into the open space left. Carnegie Cone is on the NE edge of the Santa Clara platform, 900 m above the floor of the desert. The north wall of the cone collapsed and rode lava flowing out of the newly built scoria cone. The north cone was partially rebuilt in the gap. The entire field covers over 2,000 km2. There are 10 – 11 maars. Airborne photos of the field show its black color in contrast with the surrounding desert. 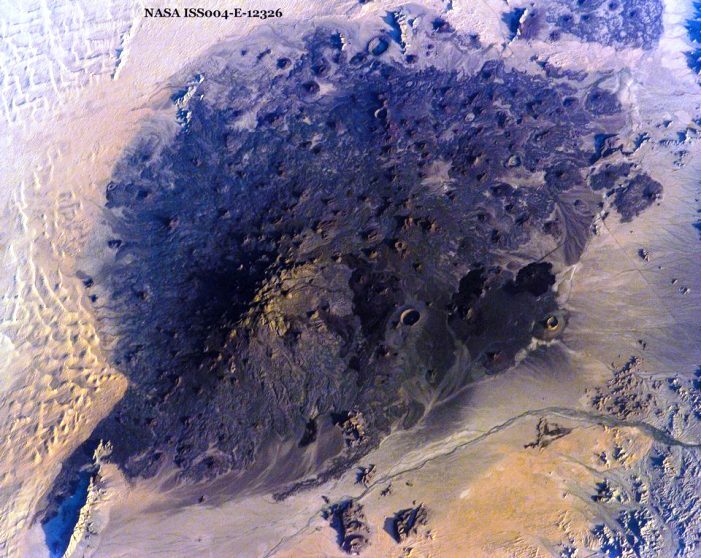 While the field is treated as a volcanic field, from the air, it looks a lot like a shield volcano that changed eruptive modes to flank eruptions since its formation. Located on the NW (Pacific) coast of Baja California, 200 km south of the US – Mexico border. 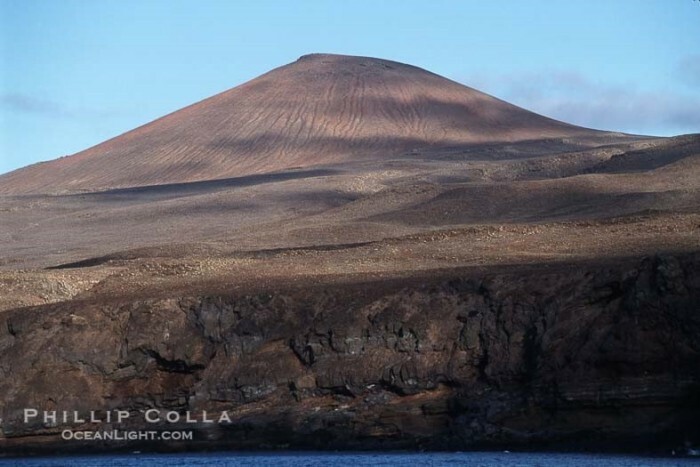 It contains 11 young cinder cones and includes a small island 5 km offshore. Low lava shields, initially submarine, are capped by scoria cones. The field is located in a shallow bay. Islands appear to have started below the water surface and grown into above water volcanoes. Youngest craters are built upon deposits thought to be 5,000 – 6,000 years old. Southern cones thought to be 3,000 years old. Recent dating suggests most recent eruptions are 180,000 – 20,000 years old. Magmas closely mirror oceanic and Basin and Range basalts in chemical content. One paper suggests that this composition is surprising given the long term subduction under the region. The field is north of a fracture zone where the spreading center was subducted. Fields farther south may have a slab persisting under them. This is the only volcanic field in Baja where lower crust / upper mantle magmas are found. This is the largest of seven Encantada Islands in the northern part of the Gulf of California. It is 3 km offshore, 4.5 km2 in area, with a 180 km cone. It is located on the NW end of the Guaymas lineament. Initial basaltic and basaltic andesitic eruptions took place below water. These were followed by dacitic lava flows and formation of tuff rings. Latest eruptions built a pair of rhyolitic obsidian domes. Dating in 2003 suggests that initial volcanism began 4,700 years ago and continued to 1,200 years ago. Shells embedded in the eruptive products were dated to produce these numbers. Mostly submerged volcano 250 km west of the coast of Baja. Two overlapping shields built on the axis of a spreading center. Northern shield is younger. 1,100 m above ocean. Pyroclastic cones. Fissure eruption. Caldera rim. Complete alkali basaltic to trachytic transition from submarine to subaerial volcanic island. Lava domes found within caldera of northern shield and basalt lava flows youngest volcanic rocks on the island. The island has a population of 213 and some of the best great white shark diving in the world. Located between Jaraguay and Arroyo San Jose on western side of Baja. Cinder cones and associated basaltic / andesitic lava flows. May be as recently active as 5,000 years ago. Northernmost of a group of large young volcanic fields. Some lava flows overlie 5,000 – 6,000 year old debris deposits. 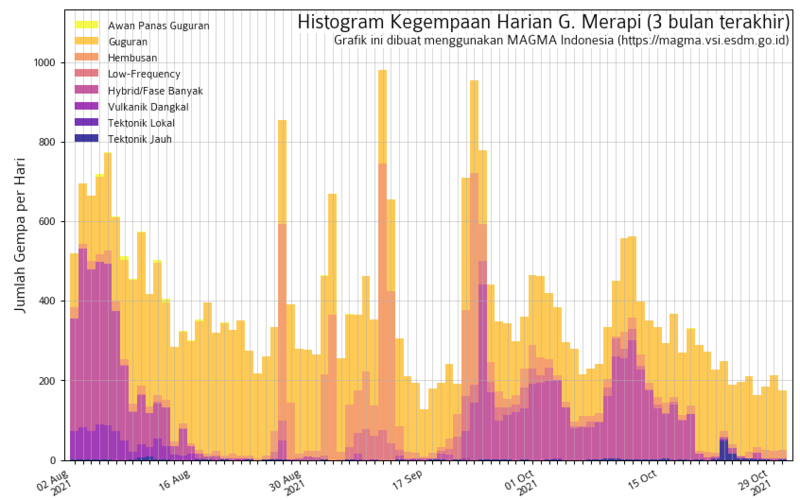 Effusive activity began 20 – 14 Ma with a peak between 12 – 4 Ma. Initial magmas were andesitic. Recent magmas are basaltic. Total coverage of cinder cones and lava flows is 2,200 km2. Larger volcanic structures tend to be on the eastern edge of the field and cinder cones tend to be located on the western edge of the field. 90% of the eruptive centers are cinder cones, though the field does include stratovolcanoes, fissures, calderas, and lava flows. This is a small stratovolcano in the Gulf of California, 3 km off the coast of Baja California. 440 m high. Fumaroles reported 1539. 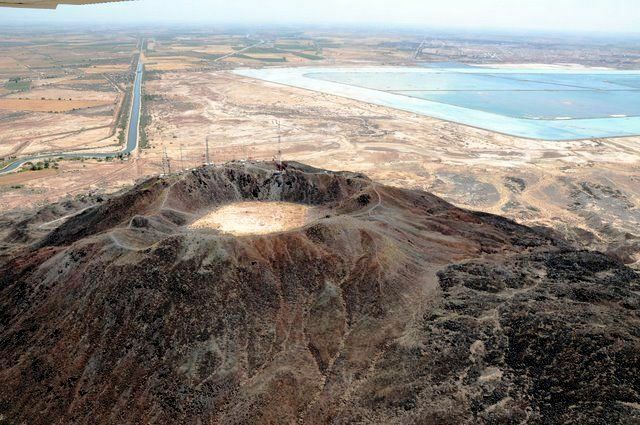 Volcano dated 700,000 – 160,000 years old. There are two periods of uplift over the last 400,000 years on the island. The most recent lava flow is dated at less than 160,000 years and perhaps as recently as 121,000 years based on coral deposits. Also known as El Rosarito, it is a volcanic field in central Baja California. It has young cinder cones and lava flows. 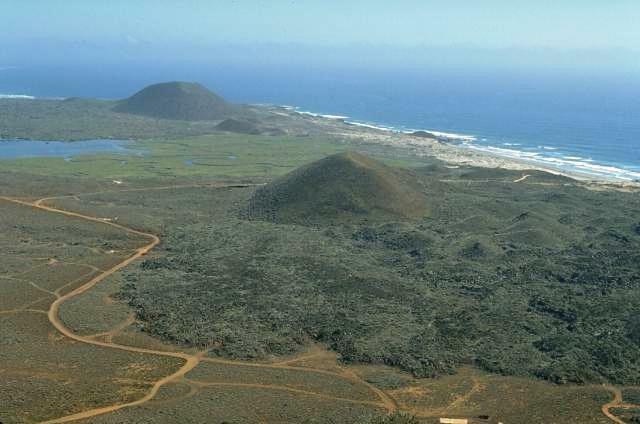 Less vegetated and therefore younger than San Quintin volcanic field to the north, meaning that most recent activity younger than 6,000 – 5,000 years. Blocky, basalt – andesitic lava flows. Total area of the field is 1,600 km2. It has at least 227 individual cinder cones, lava flows, fissure openings, spatter cones, stratovolcanoes and calderas. 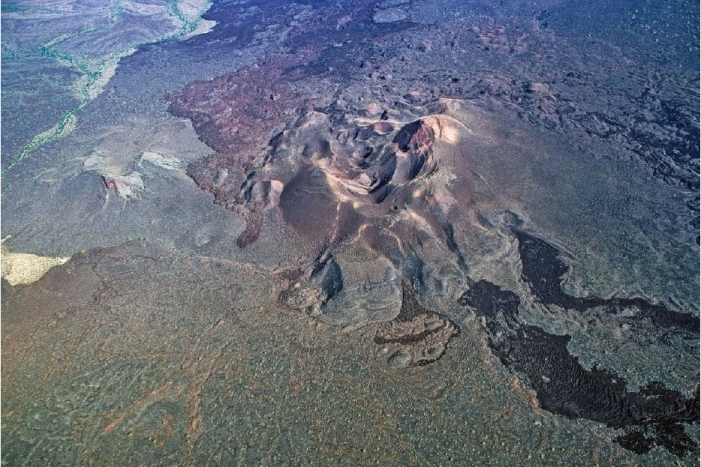 90% of the eruptive centers are cinder cones. The largest eruptive centers in this field are to the south and NW boundaries of the field. There were three phases of volcanic activity in San Borja. Initial activity began 12.5 Ma. It was followed by pulses of activity until 6 Ma. A second phase began and peaked 3 Ma. Final phase was relatively recent. The phases of volcanic activity coincide with major tectonic changes in the Baja. Magmas erupted differ significantly between those erupted 11 Ma and 4 Ma. Magmas are varying compositions of calc-alkalic and theolitic arc basalts, andesitic basalts. San Ignacio volcanic field. Google Maps screen capture. The San Ignacio volcanic field is north of San Ignacio and east of Vizcaino. Eruptive products over the last 5 Ma are primarily basaltic – andesitic lava flows from dozens of cinder cones. Activity as recent as 650,000 years. The majority of activity took place at shortly after the field was formed. The entire area is called the Santa Rosalia area. This complex is adjacent to the west of the El Aguajito and La Reforma calderas and may represent a recent expansion of those volcanic systems. 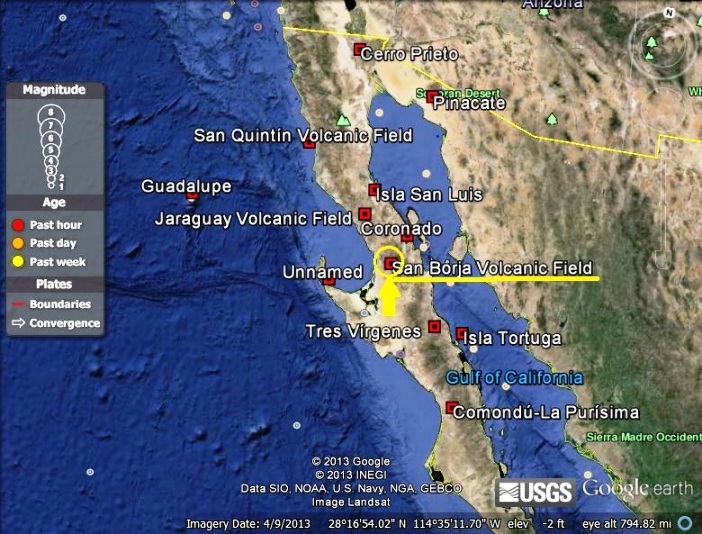 Contains the only large andesitic stratovolcanoes in Baja California. Three volcanoes, La Virgen, El Azufre and El Viejo are constructed along a NE – SW line, with younger volcanoes to the south. The youngest volcano, La Virgen is an andesitic stratovolcano with dacite lava domes. Major plinian eruption from a vent on the SW flank took place 6,500 years ago. The eruption may be older. Tephras covered 500 km2. Eruption also produced pyroclastic flows and lahars. There is a young, undated lava flow at the summit. Stratovolcanoes that get larger to the SW. Complex includes dacite lava domes, andesites, basaltic andesites, and dacites. Ash plume reported by a Spanish Jesuit priest in 1746. Possible eruption in 1857. Whatever happened in 1746 may have created an effusive lava flow. La Virgen is some 15 km3 in volume. Initial cone-building was effusive lavas overlain with pyroclastic deposits as later phases became more explosive. The most recent widespread tephra (500 km2, 1.14 km3) is dated somewhere between 6,500 and 36,000 years old. One of the younger basaltic lava flows is dated 26,000 years. The rest are not. There are three domes to the south. A geothermal reservoir under the NE base of the volcano has supplied geothermal energy for a nearby port town since 2006. Also known as Santa Ana Caldera. To the east of the volcanic complex described above. Pyroclastic flows and lavas date 0.8 – 0.5 Ma. 8 – 10 km diameter caldera. Rhyolitic lava domes dating 0.5 Ma along the northern edge. Dacitic lava domes along southern edge of the caldera appear to be older. Active geothermal system with hot springs along southern side of the caldera. Caldera-forming eruption took place 0.76 Ma ejecting at least 10 km3 of material. There is active seismicity in the region. Located on the east coast of Baja California, next to the sea. Surrounded by lava. Lavas date around 1 Ma. Resurgent dome in the middle. 10 km across. Caldera rim is not exposed. Covered by fluid lavas. Initial activity was subaqueous, with pumice flows and pilot lavas at least 5 Ma. Basaltic dikes formed 5 – 4 Ma. At least four ignimbrites are found between 1.6 – 1.4 Ma. 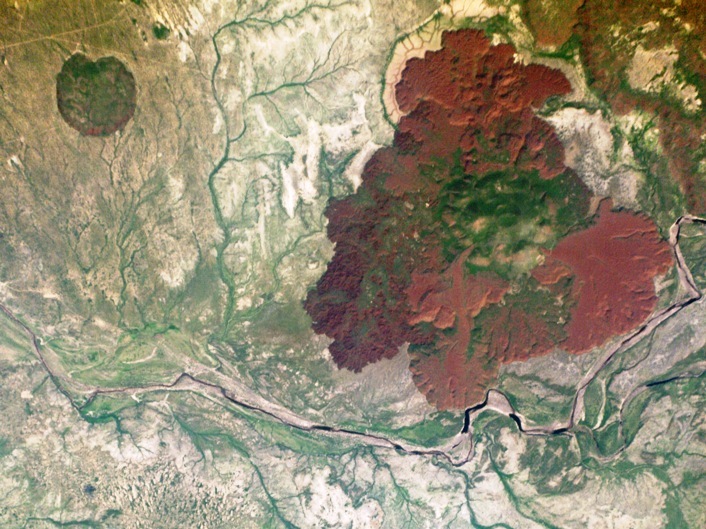 Major caldera – forming eruption took place toward the end of that sequence, ejecting 5 – 10 km3 of ignimbrites. It was followed by andesitic lava flows on the flanks and rhyolitic lava flows and domes along the ring faults around 1.1 Ma. A resurgent dome was emplaced in the caldera shortly following the eruption. Follow-on basaltic cones and volcanic activity around are not part of La Reforma and date 600,000 years old. The entire area has been uplifted 300 m above sea level by ongoing tectonic forces. There is a geothermal plant near the margin of the caldera and the Tres Virgens volcanic complex. Young basaltic shield volcano. 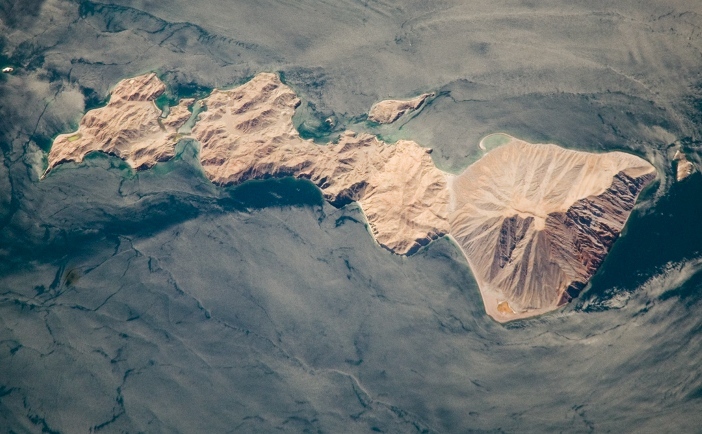 4 km diameter island 40 km off the Baja coast in the Gulf of California. Topped with a 1 km caldera. There is a solidified lava lake on the floor of the caldera. Island was constructed during periods. Activity began below water, with submarine eruptions. It progressed to build a tuff ring enclosing the caldera. Water has filled the caldera and interacted with molten lava in it forming halite. Recent lava flows cover the flanks. There are active fumaroles. 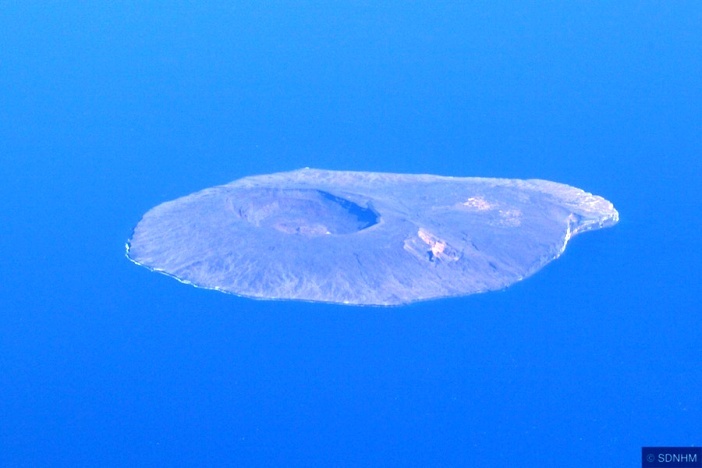 There is a submarine cone with a 2 km wide caldera 5 km ESE of the island. Volcanic field covering 9,000 km2 west of Sierra de la Giganta. Activity started before 11 Ma. Perhaps as recent as 10,000 years old. Activity took place in several phases. Initial event was before 11 Ma and erupted calc-alkaline lavas, creating large lava mesas in the east and pyroclastic breccias to the west. 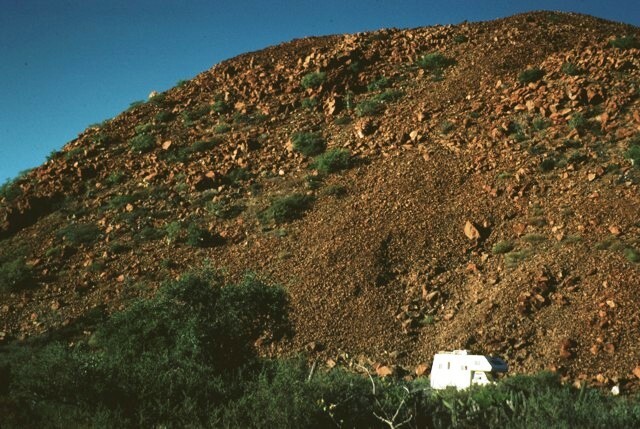 10.6 – 8.8 Ma erupted andesites and tholeiites. Next two events were 5.5 and 2.5 Ma, erupting small volumes of andesites in the central and southern parts of the field. Most recent activity started 1.2 Ma and went until recent time creating numerous andesitic and basaltic fissure, scoria cone, and lava flows. Vents occur along NNW-trending fault lines. Lava flows are offset along grabens. 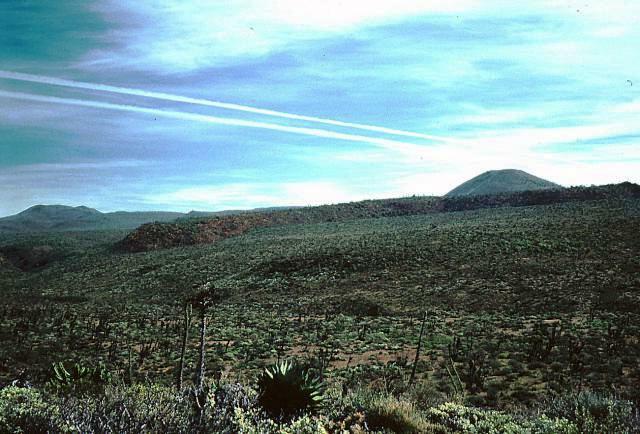 A 500,000 year old lava dome east of the southern tip of Baja California. It has an active geothermal system with hot springs and an active geothermal field. There is an active Los Volcanes geothermal field on the coast 5 km south with 18 fumaroles. Granyia posted a pair of excellent articles on volcanic activity on the Revillagigedo Islands. There is no shortage of volcanic activity in Baja California. The nature of that activity has changed significantly over the last 12 Ma since the rifting event accelerated. Some of that activity echoes what we have seen with Basin and Range volcanic activity. Much of the older activity is residual subduction related, as magmas and melts worked their way to the surface from the point where the slab interacted with mantle. And all of it has changed, in some cases substantially in a short period of time. 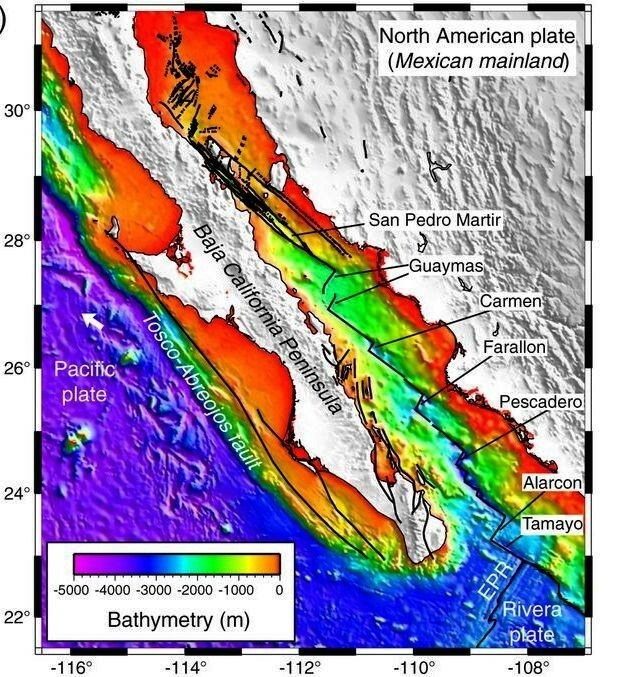 The formation of new seafloor splitting California will be one of the more interesting things to monitor over the upcoming millions of years as Baja California makes its way north to the west of the San Andreas Fault.